Today I placed another order over on the Marshmallow Blends website, which reminded me that I'd planned to review my last lot of products for you guys! 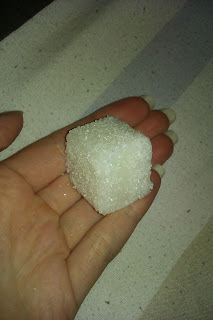 So, here goes; the AppleJack Frost Sugar Scrub Cubes. These came in a lovely tin with a pretty ribbon tied around it. I got seven cubes in my tin, and I found that I could break the cubes in half and easily have enough product to use over my whole body, making these great value for money. Being a sugar scrub, they're lovely and coarse and you can really feel the exfoliation. They also leave your skin feeling soft and moisturised, but not greasy like some scrubs can. They have the added bonus of smelling absolutely amazing - as Nicoletta describes the fragrance on her website, "A gorgeous fresh and fruity fragrance with a hint of spice." 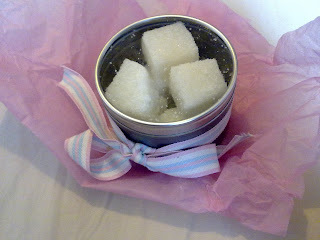 The AppleJack Frost Sugar Scrub cubes are available from the Marshmallow Blends site for £5.99. I really recommend ordering from Nicoletta - her products are gorgeous and extremely reasonably priced, and it's always nice to support small independent businesses, especially when they're run by someone so lovely! I would be soooo tempted to lick these.